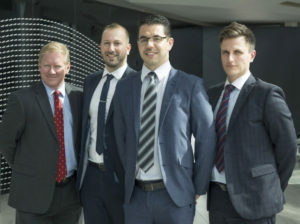 Daimler Fleet Management has appointed four sales specialists as it continues to expand its multi-brand contract hire and leasing service to fleets of all sizes. Daimler fleet management’s new recruits. The new recruits include Simon Barr, who joins as new business sales manager, bringing nearly 20 years in the fleet industry, including detailed knowledge of the public sector and extensive experience of helping operators integrate electric vehicles into their fleets. In addition, Oliver Offredy takes up the role of internal account manager, after having spent the last six years in the fleet sales team of Mercedes-Benz Retail Group, in London. Matthew Pretorius fills the position of fleet sales manager, with responsibility for supporting specialist channel customers such as bodyshops, and rental and chauffeur operators. He previously worked for a leading vehicle solutions provider where he was responsible for large corporate and public-sector customers. Finally, Ashley Boaden becomes the firm’s new business sales manager for the Midlands and North, building on 14 years of automotive experience, most recently as new business fleet sales manager for a large car manufacturer.For more of the latest industry news, click here.